Like you, I have a SaaS business, and I know that SaaS marketing is hard. There is just so much to do and so many tools to integrate with. That's why most of the SaaS marketing defaults to sending email blasts and basic email sequences. You know this is far from optimal. Every time I aspired to up my marketing process and tried to make my CRM, emails, in-app events, landing pages, and other tools work together, I failed. I had to work around marketing automation tools built for eCommerce, resort to ugly hacks, and eventually involve my dev team. Even then things were always breaking. Personalized, targeted lifecycle campaigns that increase conversions, retention, and revenue. Acquire and retain customers with cross-channel messages that feel like an extension of your product. 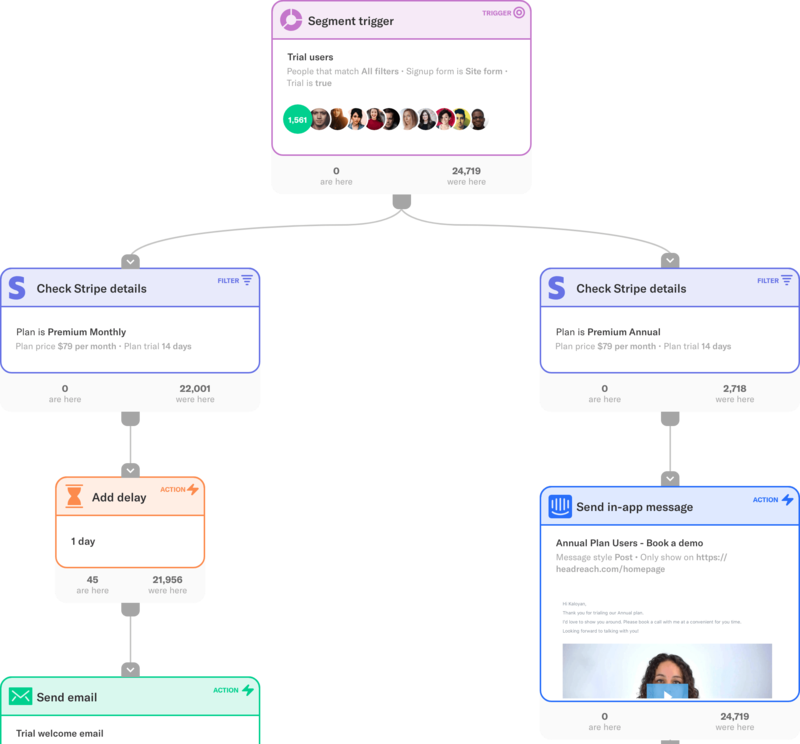 Create advanced customer journeys across your marketing tools with easy-to-use workflow builder. Never again export and import contacts in a CSV file. Simply delightful. Create personalized targeted campaigns on every marketing channel - to the right people at the right time. Convert your trial users with targeted onboarding campaigns. Put trial users in different buckets by demographics, firmographics, lifecycle phase or usage data and expose them to the most relevant content for them. Engage your high-value leads on every channel. Email, in-app messages, push notifications, and ads. Leads on bigger plans and customers with higher CLTV deserver more attention. Segment higher-value leads with billing data and aim more marketing and sales efforts at them. Predict which customers are most likely to churn by using in-app events and other usage data from your data warehouse and send timely in-app messages. Churned customers are hard to reactivate with email – they've most likely unsubscribed from your newsletter. Instead you can show them successful case studies through ads. Resend an unopened newsletter with a new subject line "Reminder: [Original Subject]". Make sure to wait a couple of days after the original has been sent. Add a tag "in sales conversation", and only send some nurture emails to such leads. Send a sequence of emails to educate your subscribers on a topic they have shown interest in (by reading certain blog posts or clicking through email links). If a user visits your pricing page several times, add him to a "Hot Lead" segment. From there assign him to a sales rep and send an email offering to book a demo. The more a lead engages with content and emails, the higher priority it is for the sales team. Show the consumed content to the sales rep, so he can tailor his approach. Use automated nurture campaigns to tend to cooler prospects. If a user goes to the checkout page, but doesn't complete the process, send him an email nudging her to finish. Assign to a sales rep to follow up. Help customers get over specific onboarding steps. When a user is stuck during onboarding, we can send him an email explaining what to do next and why. Or offer a consulting session with your customer success team. When a user has searched your support knowledge base several times or has visited a certain number of help pages, send follow-up email "Need help? Did you find what you were looking for?". Make sure to reply promptly. Follow up on failed payments to prevent churn. If a prospect is older than 90 days and not converted, and very low site/email activity, send "Are you still looking for a marketing automation solution?" Create precise segments with live data from the tools you already use. Send targeted messages to the right people at the right time. Achieve your marketing goals with the full picture of your customers. Get your apps to work together today. Bring in data from your our whole marketing stack with easy native integrations. No developers needed. Talk to your users on every channel at every stage of their customer lifecycle. Make beautiful emails with a powerful drag-n-drop builder. By bringing in data from your whole marketing stack, Encharge provides complete picture of your customer lifecycle and live activity stream for every customer.